Diving the Tunnels and Caves Dive Site in Protaras, Cyprus is a great way to practice buoyancy and skills and with a cave exit that looks like the map of Cyprus, there is plenty of fun to be had. Heroes in a Half Shell: Turtle Dive!! We had heard rumours of his existence and apparently he always appeared at the same time every day. This was it! My afternoon was free and I had no divers to guide and no students to teach so I attached myself to Pete's training session down at Green Bay, camera in hand and heart in throat. Would he still be there waiting for me? There is nothing so peaceful as watching a turtle graze at a dive site. Settling down as he moves gracefully across the seabed it didn't take long until he seemed quite comfortable with my presence. Almost a "don't disturb me and I won't run away" pact was silently agreed between us. As I pulled out the camera, he gave me a quick second glance before returning to his dinner of Poseidonia sea grass, unperturbed by this monstrous black housing I was pointing in his direction. I was certainly rewarded as he posed away for the camera, quite often looking directly into the lens for me. This was one very accommodating turtle. When he had had enough of me, he simply turned his back and this, I took as my cue to leave him be to finish his feast in style. 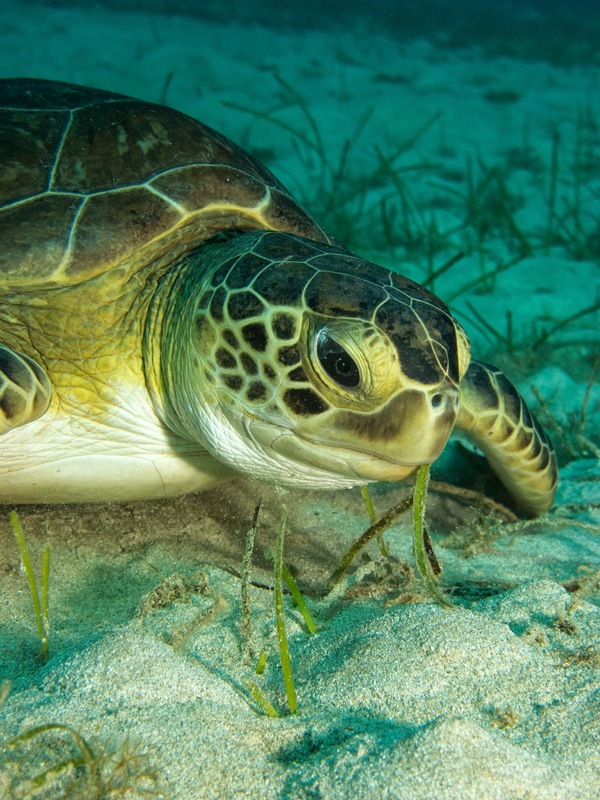 Although it can be fairly common to spot turtles here in Cyprus, one which allows you to sit with it and watch is quite rare and a great privilege also. These are majestic creatures that are desperately in need of our protection. 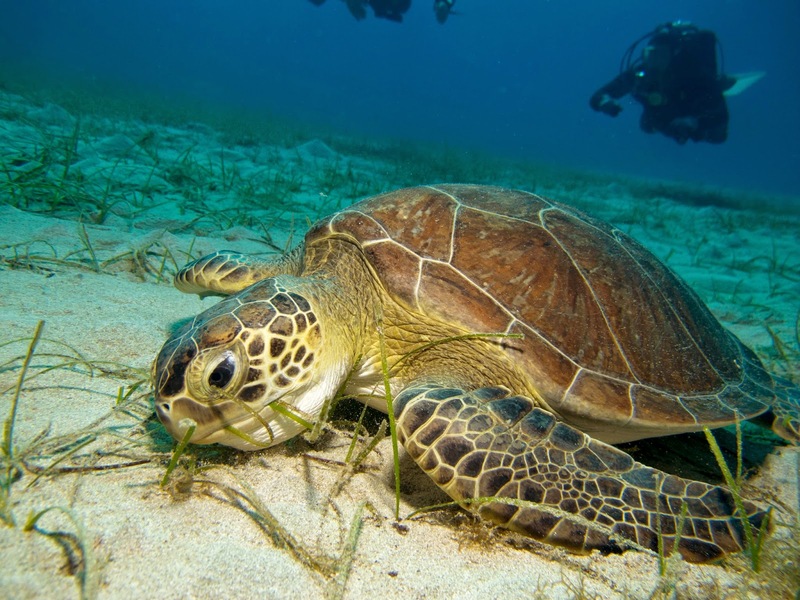 Some cultures see turtles as a resource to be exploited for medicines and cosmetics or as a delicacy for the table. Some just want to have a turtle shell for decoration, which has led to between 48% and 54% of the 328 species of turtle being threatened. 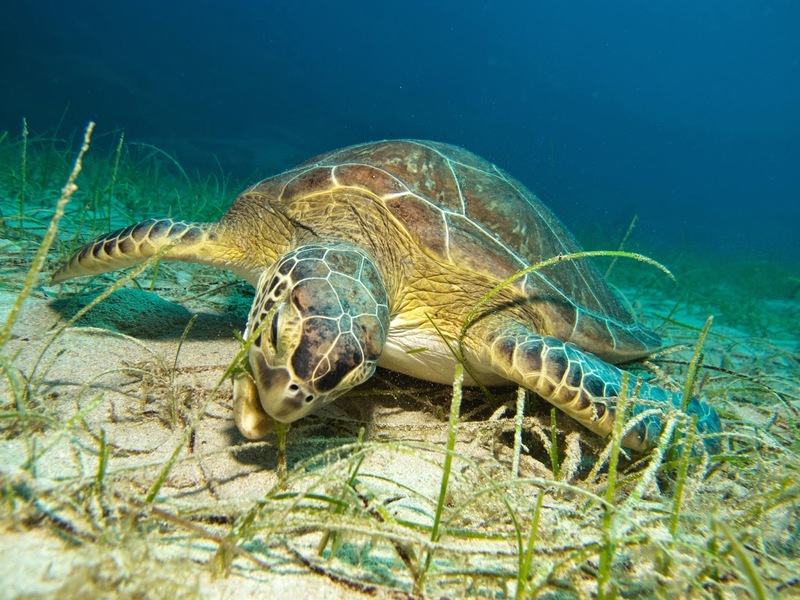 The Green Sea turtle is considered a success story after having been declared a threatened species, steps were taken to protect it and numbers have been recovering. However, there is plenty more to do. As a scuba diver I try to look out for the local wildlife by removing any rubbish and debris from the water to prevent them injuring themselves on it. For turtles in particular, removing plastic bags from the water is important, as they can mistake these for jellyfish and suffocate. Heroes in a Half-shell.... Turtle Power!!! Technical Divers diving in Cyprus on the Zenobia wreck. I have been scuba diving now for more than 20 years and the past 10 of those has been in holiday resorts. For several years I worked in a dive centre that took 2 days out of the working week to head around the pools of the local hotels, trying to tempt divers into trying scuba diving for the first time. First try it in the pool and if you think you will like it, we head out to the local shallow dive site to have a proper dive and see the fish. This isn't something we do anymore. We still take beginners for the first dive, but it is generally via word of mouth now rather than trawling the hotels. When I look back, I do remember with fondness some of the random questions I have been asked over those years and I would like to share some of them with you all. 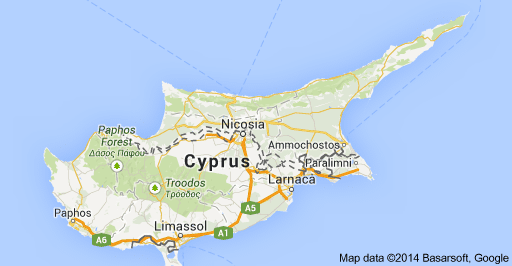 Well, this is Cyprus and if I didn't, it would be a really long daily commute! Do you see Fish when you scuba dive in the sea? Unless its the Jeep Safari day out up to the Troodos for fish. This was possibly the most common question I was asked by non-divers. 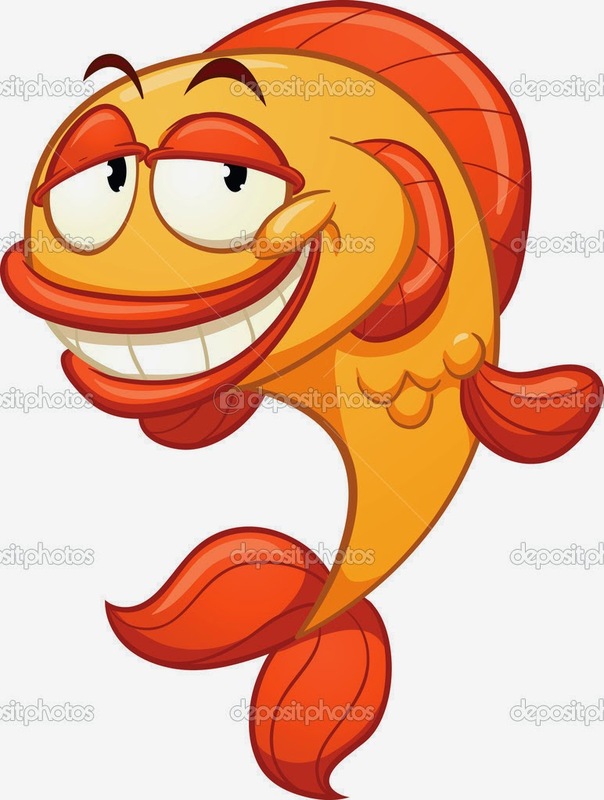 Its a loaded question because half the people wanted to see fish and the other half were scared of fish. Even the little tiddlers but you can rest assured that even in a place as over fished as the Mediterranean, you will see fish if you go scuba diving in the sea. It is always wet when you go scuba diving! The point is to submerge yourself in the water and so you will get wet anyway. We dive anyway. If you are going to get wet, it may as well be under the water. I really want to try Scuba Diving but do I have to wear all that equipment on my back? Do you want to be able to breathe? 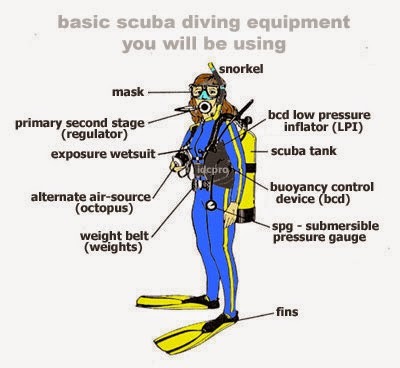 Unfortunately, the equipment is a vital part of the scuba diving experience. We have to take our own air underwater because we cannot breathe without it and we need a means of breathing from the tank of air and connecting it to our bodies. Without the equipment, its just free diving and/or snorkelling. When you Scuba Dive, How does the Snorkel change the Water into Oxygen? This was my personal favourite. the best question I have ever heard from a non diver! If I knew the answer to this, I think I would be a very rich diving instructor and they don't come along often. In a change from the norm, this blog was just a bit of fun, sharing some of the questions I have had over the years that have made me laugh. 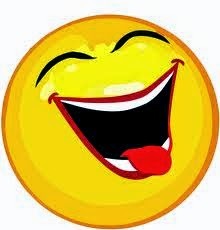 Hopefully, some or all have put a smile on your face. Let us know what questions or statements you have heard over the years that cause a giggle and let's send the laughter round the Internet and spread the fun! Diving the Lady Thetis Wreck in Limassol. This is the second of the new wrecks that have been sunk for scuba divers and is settled in just 18 metres of water. Perfect for all levels of scuba and a great second dive after the Costandis Wreck. Shearwater Petrel: Why you Want one! Towards the end of last year I finally decided that I had spent enough time completing all my Technical Dives using computer generated tables and it was about time I invested in my very own Tech Computer. After having a look at the different makes and models on the market, I decided to opt for the Shearwater Petrel. I have used the Petrel's predecessors before (the Shearwater Predator and the Pursuit) and I always found them pretty intuitive and easy to use and the Petrel was no different. Without even looking at a manual, you can easily navigate through the menus and set up the dive and plan it, although I would recommend that you always read the manuals for a dive computer, as it is giving you very important information and you need to know exactly how it works and what it is telling you at any given moment. 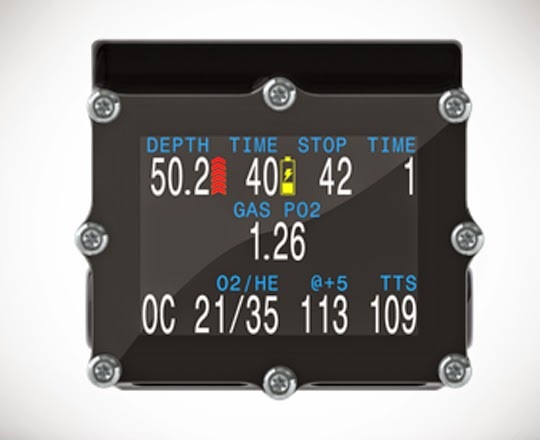 The Petrel, unlike the Predator, has an LCD display, which is 2.4 inches and is full colour HD with a low power consumption. It is smaller and lighter, more compact but very easy to read whether you are at the surface, in Open Water or deep inside a wreck. Also, the clarity and size of the screen makes it easier for buddies and instructors to monitor where you are at any given time. It also gives colour coded warnings, so if a value shows in Red or Yellow, it means something isn't quite right, there is a problem. You can easily change the battery yourself and it is powered by any AA battery; lithium, alkaline or saft. The battery Fuel Gauge is a useful way of knowing when the power is getting low too. Where many of the other Technical Diving Computers require you to upgrade your computer by buying a PIN to unlock the software, the Petrel comes straight out of the box open for Open Circuit and Closed Circuit, Air, Nitrox and Trimix. 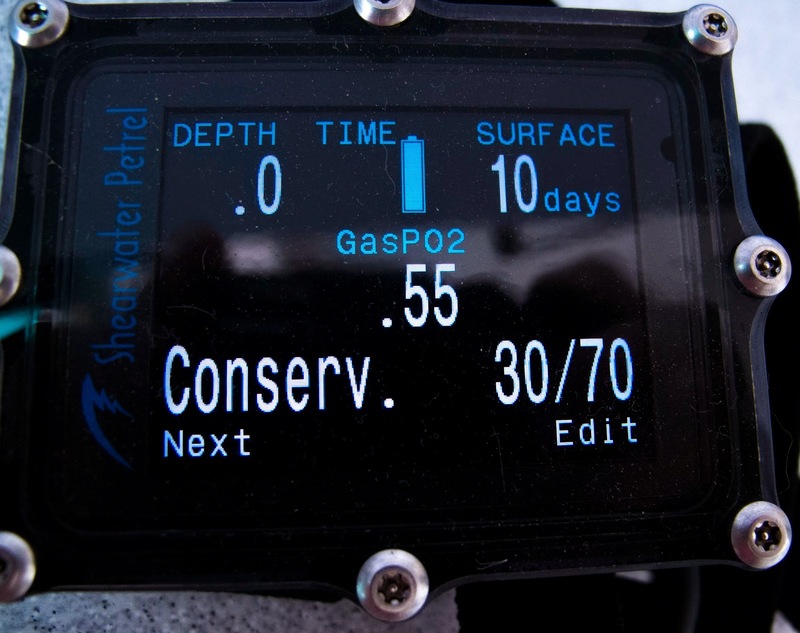 The Decompression Software uses Buhlmann ZHL-16C with Gradient Factors, which come preset at 30/70 but can be user adjusted to complement the type of diving you do. There is an optional upgrade to VPM-B, if desired. I like the way it comes! A recent firmware upgrade (which is free and downloadable via bluetooth) has introduced a new recreational Nitrox mode. In this mode, the menus are simpler and the display is less cluttered and customisable. It allows for 3 breathing gases, as opposed to the Technical Mode's 5 gases, and the emphasis is for Maximum Operating Depths (MODs) and No Decompression Limits (NDLs). There isn't quite the same control over the conservatism settings as you have in Tech mode, but you can still select between 3 levels of conservatism and the Petrel will gove you a safety stop countdown for 3 minutes when you come above 6 metres or, of you exceed a NDL, the display turns red and warns you must complete a mandatory decompression stop with depths and times shown. 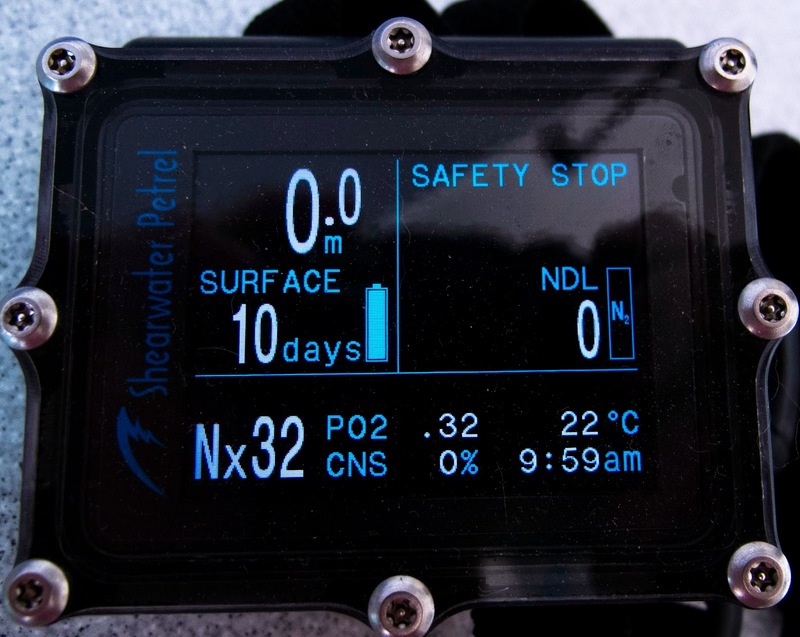 The Shearwater Petrel is one of the best dive computers I have dived with and I have taken to using it on all dives from shallow beginners to penetrating the Zenobia wreck, air diving to trimix. It is versatile, adaptable and above all, exceedingly easy to read and use. For the price tag of approximately €840, this computer offers exceptional value for money! The Constandis is one of our new wrecks in Cyprus. It was sunk in Limassol in February 2014 for scuba divers to enjoy and is a fantastic new addition to our Cyprus Wreck Tours. The Constandis sits now in approximately 24m of water and has some great things to view on the outside while there are also some easy penetration options for divers that are a little more adventurous. We can already see the beginnings of fish life around the wreck and are looking forward to seeing what will be attracted by this new wreck dive.